A dream is are now a reality: a really, really easy way to build, run/debug an application! Historically, launching (debugging or executing) a binary with Eclipse has been a pain: I need to open debug/launch configurations, it is hard to select the correct configuration, and so on. Until now, with Eclipse Mars and the Launchbar :-). ‘Local’ is maybe a bit misleading: it will use the local GDB/debug connection. But it would be possible to use e.g. SSH to a remote board/client/etc. This entry was posted in Building, Debugging, Eclipse, Embedded, Tips & Tricks and tagged Building, Eclipse, software, technology, Tips&Tricks by Erich Styger. Bookmark the permalink. I just went to download Eclipse Mars and found that there is now Eclipse Neon. Do you know anything about this one yet? For instance, is it stable, and can your instructions for Eclipse Mars be “generally” applied to the Neon edition? Mars has been released in June 2015, and the next release is Neon which is expected mid 2016. Thank you. I can wait for Neon then. I did not know how often the releases came. THANK YOU for all the help you have provided to many thousands of people worldwide with your blog over the years. Does this work as a KDS substitute? yes :-). I mean you can build with Eclipse MARS an better IDE than KDS (99% the same functionality, but bleeding edge tools). you are on hackaday with this! I don’t get a “Run” selection in the drop-down menu – just Debug. I think I have to set up a “Run configuration” to make that show up, but I don’t know how to set this up. Is there a way to just have it program the flash and not launch a debugger? I have a ‘run’ in the drop-down, I had not to do anything special at all. But for programming the flash you always need some kind of debugger. What is wrong with using the debugger for it? Nothing, but I don’t want it to hit any breakpoints, and would like to be able to close the IDE and not have it stop execution on the microcontroller. It took two tries, the first ended when I installed KSDK and close to the end Eclipse informed me the jar was corrupt. After removing KSDK, downloading a new copy and installing it I couldn’t get Eclipse to let me install it, it wanted to ‘fix’ something then would die. 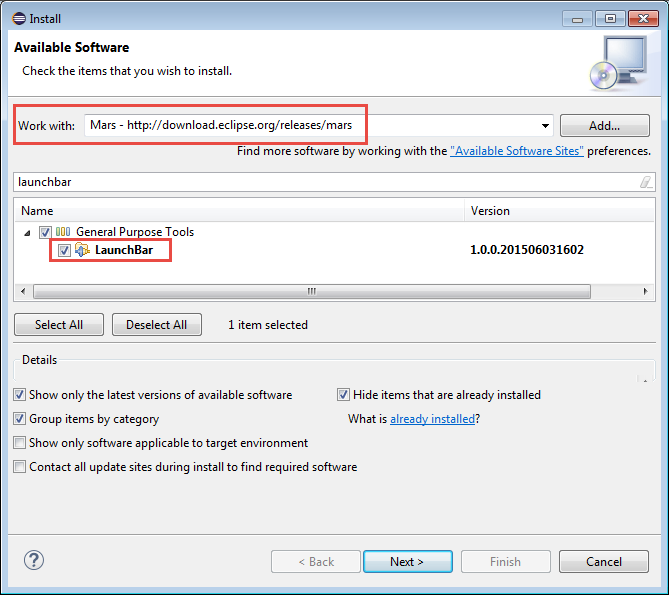 Created new folder and started over with a successful install up to installing the MCUonEclipse components, everything installed all right but when I restarted eclipse it hung at “Loading org.eclipse.compare” I installed the latest (was using Java 7) version of java, no help. I can get it to run with: eclipse -clean -refresh — that is the only way it will run. !MESSAGE Unable to acquire PluginConverter service during generation for: C:\MCUEclipse\eclipse\plugins\org.eclipse.cdt.embsysregview.data_0.2.4.freescale. There is a lot of those messages. Thanks for upgrade to MARS! !MESSAGE The ‘org.eclipse.ui.startup’ extension from ‘com.freescale.processorexpert.compatibility’ does not provide a ‘class’ attribute. This usage is deprecated and a ‘class’ attribute should be provided. The release after Mars (4.5) will no longer support the deprecated usage! !MESSAGE The ‘org.eclipse.ui.startup’ extension from ‘com.freescale.processorexpert.core’ does not provide a ‘class’ attribute. com.freescale.processorexpert.core: PExCore: Invalid ID of the project component (fsl_lptmr_hal).